If you still appreciate your furniture for its design and comfort, why buy a new one to replace it. Buying new furniture as a replacement to old ones is not always the best idea. Better, get it reupholstered. Reupholstering can be considerably cheaper than buying new furniture, especially when you are looking for superior brands. Not only the money, you will have to go through all the hassle of redefining your needs and re-evaluating your alternatives. At Mastercrafts Upholstery in NYC, we will breathe a new life into your comfortable, quality furniture so that you can hold on to those sweet memories without having to find a new piece to fit your living space. Our network of topmost fabric suppliers allows us to offer a wide range of high durable and high standard fabrics customized to meet all your requirements. Why us for upholstery in NYC? Our years of design and technical experience in both, home furniture and commercial re-upholstery, will inspire and assist you in making the absolute perfect choices. Whether it’s for a single room or an entire development, our talented crew can offer innovative suggestions and advice. 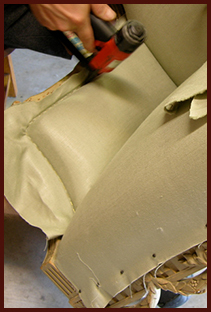 We specialize in providing furniture re-upholstery service in NYC. Starting from very simple chair or sofa to a complete renovation including window treatment or wall upholster, we can do it all. We will work with you to choose the perfect fabrics to renew your beloved furniture items. We can completely change the look of a thrift store find or of an heirloom that has been in your family for generations. Besides this, we also excel in furniture repair, antique restoration, furniture refinishing and furniture design.